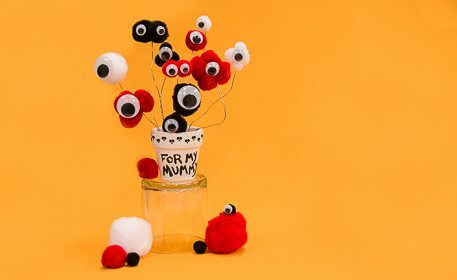 Surprise your mummy with a spooky bouquet made with poms and wiggly eyes. All eyes will be on this decoration at your neighborhood Halloween party! Step 2. Start by cutting 5 pieces of craft wire. Tip: You may want to cut your wires long and trim them once they are placed in the pot to decide. Fold each wire in half and glue the fold of the wire to the inside bottom of the pot. Hold in place until dry. Glue together pom and wiggly eye “flowers”. Glue the “eyeballs” to the top of each wire. Bend wires into kooky shapes for as the flower stems. Tip: If you desire, cut the wires shorter in the front and leave the wires longer in the back for a staggered look. Use a thin paintbrush and black paint to write “For My Mummy” on the front of the flower pot and add skull trim to the top of the pot.